Meringues are much simpler to make than their reputation suggests. The basic rule is that for every egg white you use, you should use 55g caster sugar. You also need to get a feel for when to add the sugar and when to stop whisking. I find cream of tartar, which works as a stabiliser, makes the whole thing less unpredictable, though you can manage without it. Start by preheating the oven to 140°C, gas mark 1, remembering to adjust the heat for fan-assisted ovens. Line 2 large baking sheets with baking parchment. Pop your eggs in a large, thoroughly clean and dry mixing bowl with the cream of tartar. Eggs towards the end of their life will give a better volume, so save really fresh ones for poaching. They need to be at room temperature, rather than fridge-cold, and free from any protein from the yolk. The more room there is, the better your volume will be, so use a big bowl. Start whisking on low, building up the speed as the whites expand. Once they are really stiff and there's no wobble, they are ready for the sugar. Egg whites can be overwhisked, which ruins their elasticity, so be careful. They should look smooth, with no lumpiness around the edges. Add the sugar 3 tbsp at a time and quickly whisk in after each addition. Stop once the mixture is thick and moussey and stands in peaks when pulled up by the whisk. Dab a bit of your mixture under each corner of the paper to stop it moving. Spoon on 2 heaped tbsps of mixture and repeat until you have eight mounds, leaving enough space for them to expand a bit. 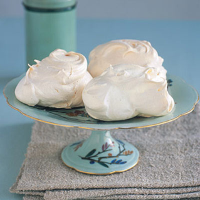 A meringue's charm is in its quirky peaks so don't worry about being too neat. Pop them in the oven on a low shelf and bake for 45-60 minutes until crisp on the outside, then turn off the oven and leave them to cool with the door ajar for 30 minutes, to cook the insides further. Remove from the oven, lift them off the paper, and serve as they are, or with cream and fresh fruit.